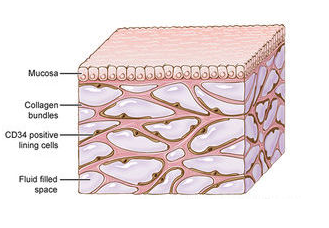 The interstitium. Credit: J. Gregory, Mount Sinair Health System 2016. Scientists have discovered a new piece of human anatomy we never knew we had—a layer of connective tissue that exists all over the body. It sits below the skin’s surface, lining the digestive tract, the lungs, and even our blood vessels. Researchers say it could be the missing link the medical community needs to move forward in a number of areas of research, including cancer and autoimmune disease. But it could also explain so much more, including why our skin sags when we’re old, and how acupuncture could work. Neil Theise, professor of pathology at NYU School of Medicine, and Rebecca Wells, professor of medicine and bioengineering at University of Pennsylvania, join Ira to discuss their discovery—and their theories about the the interstitium. Neil Theise is a professor of Pathology at the NYU School of Medicine in New York, New York. Rebecca Wells is a professor of Medicine and Bioengineering in the Faculty of the Center for Engineering Mechanobiology at UPenn, part of the University of Pennsylvania in Philadelphia, Pennsylvania. IRA FLATOW: This is Science Friday. I’m Ira Flatow. Have you thought about your interstitium today? You never heard of it? Well, apparently it’s a new organ scientists say we never knew we had, a layer of spongy connective tissue that exists all over the body, including below the skin surface, lining the digestive track, the lungs, even our blood vessels. And it could be the missing link the medical community needs to advance cancer and autoimmune disease research. So why has this so-called organ remain undiscovered until now? Here to share with us their discovery, as well as their theories as to what exactly the interstitium has been doing all this time, our Neil Theise, professor of pathology, NYU School of Medicine, welcome to Science Friday. IRA FLATOW: And Rebecca Wells, professor of medicine and bioengineering at the University of Pennsylvania, Dr. Wells, welcome to Science Friday. IRA FLATOW: So Neil, how did we miss this? Where has it been hiding all this time? NEIL THEISE: Well, the gold standard for the microanatomy of the body is what we see under the microscope. And what’s interesting about this space is it’s a fluid filled space that’s supported by this collagen bundle network, or lattice. And in living tissue, it’s filled with fluid. But when you take out tissue from the body, the first thing that happens is the tissue drains out. The spaces collapse. The collagen bundles layer on top of each other. So whenever we’ve seen this structure under the microscope for the last 150 years, it’s always looked like this dense wall of collagen, and that’s sort of been our understanding of normal. You can sometimes see faint little cracks in it. And as a pathologist, looking at clinical specimens all the time, my teachers taught me that that was artifact. We had torn the tissue. But now looking at it, we realized, no, those are the remnants of the big spaces. The artifact is actually the real thing. And what we thought was real– this dense wall of college– turns out to be the artifact. IRA FLATOW: Wow, and Dr. Wells, paint us a picture of are there cells in it? What’s inside of it? What’s it made of? REBECCA WELLS: So inside of it, the major structure, are some bundles of collagen. So we knew there was collagen there, but we didn’t quite appreciate that they were really bundles floating in fluid. There’s also elastin which is an elastic fiber, as you might guess. There are a large number of proteoglycans and glycosaminoglycans. Those are proteins that have very large sugar residues attached. And glycosaminoglycans are large chains of those sugar residues. And there are also some cells that we don’t understand at all. We know that, at least right after birth in a mouse model, there are cells that seem to be depositing all of that collagen, but we don’t see that kind of cell in adult structures. And so we need to figure out does one cell type become the other cell type? What is the meaning of those cells? Does it mean that we, as adults, have cells that in the past produced a lot of collagen are now dormant? We just don’t know the answer to any of those questions. IRA FLATOW: Dr. Theise, you said that these fluid filled spaces could be linked to the lymphatic system. Give us that connection. NEIL THEISE: So when we were trying to figure out what this fluid filled space was, our first guess was could it be some weird form of blood vessel? But for a variety of reasons, that’s not it, and they’re not filled with blood. They are filled with protein rich fluid, as Becky just described, so it looks like lymph. So we thought, could they be lymphatics? But for a variety of reasons, we excluded that too. Then we’re left with the third space, and it’s actually been called the third space. In hospitals, people with lots of edema– let’s say with renal disease or post-operation– they call it third spacing, so that word exists. And what they mean is the interstitial space, which is not a new word. It’s an old word. It’s where the fluid is that isn’t in the blood vessels, not in the lymphatics, and not within cells. It’s all the extracellular fluid that’s outside of all that. It’s about 20% of the fluid volume. That’s where the lymph for lymphatics comes from. IRA FLATOW: And so could that be like, I want to say, the underground waterway system to carry other things to other parts of the body, maybe stem cells or maybe cancerous cells or things like that? NEIL THEISE: That certainly is the question. And in the paper, we actually show that stem cells do that, and some kinds of inflammatory cells move through this space into lymphatic. So we actually demonstrate that concretely. This is one of the interesting things. Tumor cells– tumor of the skin or of the digestive tract for example– until it got to that dense connective tissue layer, which now we know is fluid, they wouldn’t metastasize, spread to lymph nodes, until they got to that layer. But it’s sort of an unasked question. How is it that this dense connective tissue layer would facilitate spread? You’d think this wall would prevent it. Well now we know, it’s a fluid filled highway. And in the paper, we show the tumor cells invading into this space, they go directly to the lymph nodes. IRA FLATOW: Wow. So Dr. Wells, what are the next questions you want answered about the interstitium? REBECCA WELLS: That’s about 20 years worth. I think we have to develop a much better understanding of how this space connects to lymphatics and to lymph nodes, since it almost certainly does. I’m very interested in what the cells in this space are, and how they might be related to fibrosis, which is the development of scar tissue after injury. And I also think we need to understand more about what this space is doing mechanically. Is it acting as a shock absorber for all these organs in the body? And really, what does it mean to have fluid flowing through it? So those are my three big questions. IRA FLATOW: Let me go to a quick call from Rob in Cleveland. Hi, welcome to Science Friday. ROB TRUAX: Hi my name is Rob Truax. I’m a osteopathic physician, and this has been a very interesting phenomena. And I’m a professor at the Ohio University here at this College of Osteopathic Medicine. And this article, since published, has actually been spread to our department. Because as DOs, as osteopaths, we’ve had literature for over 100 years about the values of lymphatics and the fascia and it’s used in health and disease and the use of osteopathic manipulation to address fascia and its relationship with lymphatics. Now, I don’t know how the scientists there and the researchers consider the idea of fascia in relationship to their interstitium. IRA FLATOW: OK, let me get– what do you think, Neil? NEIL THEISE: That’s one of the layers that’s turned out to be this space, is the fascia. So traditionally, histologically, we say it’s dense connective tissue. And yet the osteopathic world, as he said, knows that no there seems to be some sort of fluid relationship between them and the lymphatics. So one of my hopes, actually, when this paper came out was that his community would see it and go, ah, OK, now we have an anatomy for the stuff we’ve been talking about physiologically. IRA FLATOW: Fascia-nating. Sorry. Dr. Wells, we talk about it perfusing the body, is there a brain barrier to it? Does it also get into the brain? We know about the blood brain barrier. Is there any interstitium brain battery, or is it up there also? REBECCA WELLS: I don’t know. I’m going to punt that one to Neil, who’s the pathologist. NEIL THEISE: And as a pathologist, I’m sort of scared of brain. But I asked our neuropathologist about this, and they came running to me with some tissue from the spine from an operation yesterday, and we saw it. But the details of that, I have no clue about. I mean, that’s another area that someone needs to investigate. IRA FLATOW: Wow, you would think that would be a huge area. IRA FLATOW: It certainly surprises me. I’m not very smart, but I’ve been reading and writing about the stuff for 40 years. To find out there’s something new, that we don’t even know the most basic stuff about, and I mean even speaking specifically about the brain and the interstitium. NEIL THEISE: Someone asked me in an interview this week what else I thought was out there to discover. And I was like, well, if we knew, we would have discovered it already. There’s always more. Every time you develop a new technique, a new perspective, a new way of investigating something, you’ll find stuff you missed that wasn’t caught by the prior things. The only thing that happened here is we were collaborating with some guys who had a microscope that could look in human tissue at the microscopic level while it was alive. IRA FLATOW: So you could see it in action, instead of on dried out slides. NEIL THEISE: Right, exactly, and that made all the difference. And it couldn’t have happened with any one of us. It had to be the team, because we all brought different perspectives that could make sense out of it. NEIL THEISE: And openness to working with other people across boundaries. IRA FLATOW: Dr. Well, you confirmed the tissue network was made up of collagen. What does collagen do, and what role could it be serving here then? REBECCA WELLS: Well, so in the body, collagen is the major structural protein. Collagen is really what holds you together to a large extent, and so it’s providing structure to the skin, to the bile docs, to the GI tract, et cetera. What it’s doing specifically, if we drill down a little bit, I think it certainly could serve as a highway for cells to travel along in cancer metastasis. It may well be doing that. The cells of this space are adherent to collagen, and that may be very important to their function. We don’t know that, but I think that that’s possible. IRA FLATOW: Does this discovery lend any mechanism for acupuncture or acupressure working, an explanation for it, because I’ve heard this on the news all week? REBECCA WELLS: I would say both Neil and I are actually quite tickled by that. I think it does suggest that there may be a very clear anatomical mechanism for the way acupuncture works, and for the fact that acupuncture does work which, I think has been very well shown. And understanding some of the chemical properties of collagen may help us understand acupuncture even further, knowing that this space is filled with collagen bundles. But that’s something that we’re investigating right now. NEIL THEISE: And there’s work from like 10 years ago of Fellow Edward Yang, who I was in touch with, who showed that they’re using MRI machines to measure sound waves in tissue. That sound waves, if you put a needle on the skin randomly, it goes a centimeter in all directions. But if you put in on an accu-point, it travels all the way up the meridian. And we talked on the phone– this was 10, 15 years ago– about where could that fluid wave– what cells was it passing through? We never thought there was actually a fluid channel. So now it raises the question, are these collagen bundles arrayed in such a way that they dampen fluid movement off of the meridian, and maybe the meridian corresponds to a channel created by these structures? We can now have hypotheses about this stuff that we couldn’t make before. IRA FLATOW: And you can actually pointedly study stuff. IRA FLATOW: Because you didn’t know it existed before. You couldn’t. NEIL THEISE: Correct, yeah. Tell them about electricity, Becky. IRA FLATOW: Got 30 seconds, Becky, quick. REBECCA WELLS: No, it was what I said before. NEIL THEISE: Becky found this out. Go ahead, quick. REBECCA WELLS: No, I think that collagen has some interesting electrical properties. And knowing that there are these big collagen bundles that run through in this space, if it has these certain electrical properties, it does make you wonder how signals might be transmitted across the collagen. IRA FLATOW: We’ll be back to both of you. Rebecca Wells, Neil Theise, thank you both for taking time to be with us today. Scientists are making tiny microchips that can breathe, digest and pump blood like human organs.